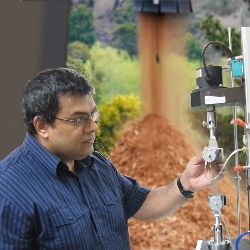 Ravi Mehai, with Econotech since 1990, taking a tensile measurement of a pulp sample. From raw wood (or non-wood) through to pulp, paper, or board, Econotech has the testing capabilities to help you ensure smooth operations and product quality. Below is an overview of the ways we can assist you; for more details, consult the "services" menu above. Are the chips you're acquiring up to standard? We can identify the species as well as any off-spec materials. A chemical analysis of wood chips can determine the cellulose, hemicellulose and lignin content which affects both the conditions required in your digester and the final physical and optical properties of your pulp or paper. We also provide other important tests such as measuring the chloride content of chips; chloride can contribute to dead-load in your recovery process. If your furnish must change, we can even help you with a small scale pulping trial. Econotech routinely measures kappa number, viscosity and other properties on pulp and has expertise in identifying unknown mineral deposits that build-up. If you're developing a new product, or changing furnish or a chemical (eg - stop using AQ, or start using some new additive), a pulping trial could save you time and money. We can also determine any effects such a change might have on your product by analyzing its physical and optical properties. Want to produce a new grade? Perhaps you're interested in dissolving grade. Or, maybe you need to make changes to your bleaching operation. A pilot trial with Econotech is a cost effective way of sorting out conditions. In addition, we can test bleaching chemicals for Cl-, ClO2-, ClO3- and pulp, paper, and effluent for organic halogens (AOX, TOX) etc. Whether you're making changes or troubleshooting problems, you can count on our physical & optical testing group to help you out. Pulmac rejects, Bauer McNett fiber classification, and fiber quality analysis (FQA) can provide you with informative data for refiner optimization projects. If your screens are plugging, we can analyze & identify any contaminants. Econotech has a fully equiped constant temperature and humidity (CT&H) room and decades of experience in physical & optical testing of paper, packaging and pulp, including fluff grades. We also offer a wide range of chemical analyses and microscopical analyses on these products. Our pilot plant can simulate the production of either viscose or acetate grades of pulp and can also provide detailed information on their properties. Be sure to email us if you have any questions.